Here’s Our Top 5 Tips for Getting Your Child’s Viewing Habits Under Control…..
Set a time limit before they even turn on the TV or computer. It helps if they have a visual such as a timer and reminders about how much time they have left. When the timer goes off, so does the screen. This should go on without question. No negotiations! The easy thing is you can always unplug the electronics if they resist. Homework and chores must be done before TV or computer time. Check their homework and ensure they finish chores. Viewing time will be much more rewarding for both of you. Present your child with alternatives when time is up. This may make the transition easier and they are less likely to argue. Games, reading, arts and crafts, sports – plan something out that is readily available to them. Know what your child is doing. Check out their online activity and have them explain the game to you and whether or not it is online or a disc, etc. Do they play or chat with other people? Use your safety judgement. Violence is out and age-appropriate is in, especially with things they show on TV. Have a solution for their protests. Yes, they may be in the middle of a game or show but they should have known their time was coming to an end. Ask them to save the game they are playing or suggest you record the rest of the program. DVR is a great option, too. Today I wanted to start collecting some really good resources on a topic that’s very near & dear to my heart, baby sign language! I can’t even tell you what a HUGE fan I am of this concept; it’s easy, everyone can do it, the educational and developmental benefits are incredible, and best of all…it takes away a lot of baby’s frustrations, which means fewer tantrums. Even if you start to teach your child signs and later decide it’s just not for you, the exposure to the concept of signing will have done nothing but good (you don’t have to worry about screwing your kids up for life if you don’t complete an entire signing “program”!). These days there are MANY different books, videos, and classes you can invest in to learn the secrets of signing, but the basic premise on which they are all built: speaking is a physiologically-complex task that requires the coordination of several fine motor skills (movements of the tongue and lips, breath control, vocal cord tension, etc. ), while signing uses only gross motor skills of the hands and arms. Believe it or not, as soon as you are able to make & maintain eye contact with your baby (generally 2-3 months), you can start teaching them to sign! It’s important to note that most babies won’t begin to sign back to you until they are 8-10 months; however,. 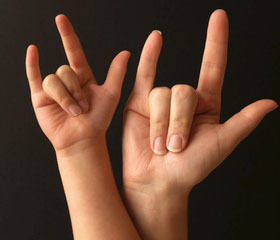 There are two schools of thought when it comes to the actual signs used; the majority of programs today use a slightly modified version of ASL (American Sign Language), but the more Montessori-style idea of allowing the child to guide the process and create their own gestures (which the parents then adopt) is quickly gaining popularity. 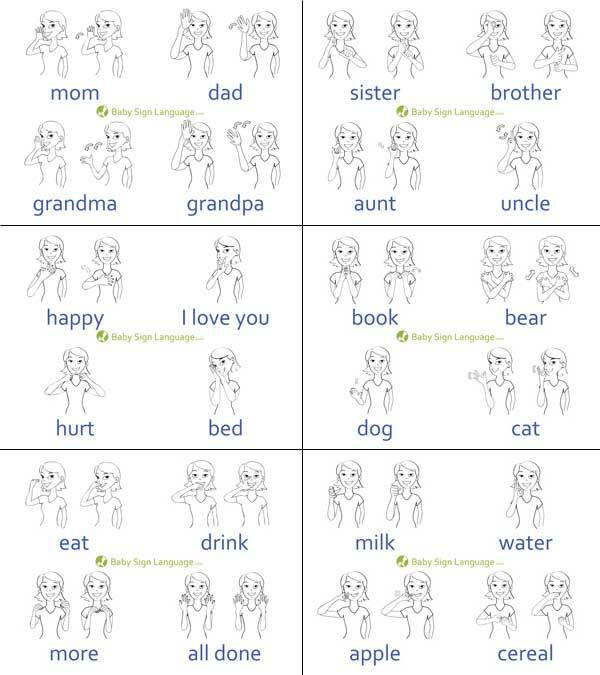 Both methods can be equally effective in terms of establishing communication; however, if your ultimate goal is to continue to teach signing as a second language, it is more effective to use the ASL-based system from the beginning. If you know of any good references, I would LOVE to hear about them! Feel free to post them in the comments section below…. 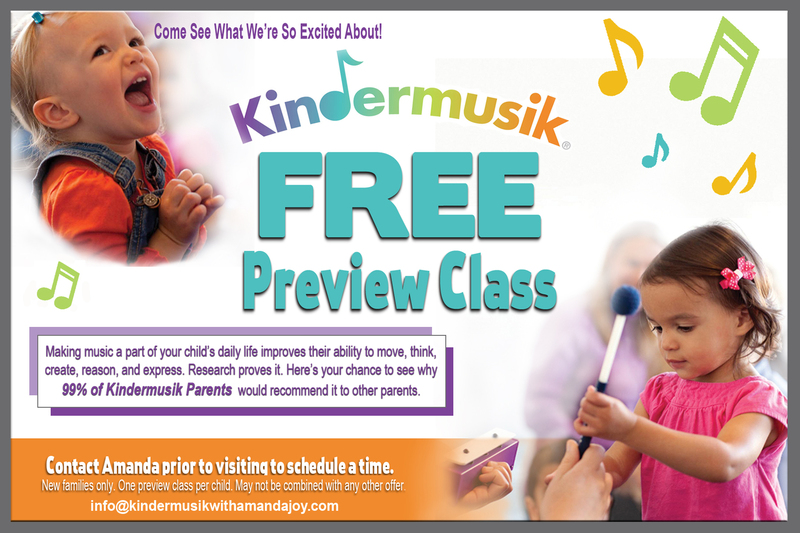 Posted by Kindermusik with Amanda in Child Development, Early Childhood Education, Ideas for Activities with Your Kids, Kindermusik, Learning, Music Makes a Difference!, My Kindermusik Studio, Parenting Info, Uncategorized, Why Kindermusik? If you’re in the Philadelphia area & interested in trying out the World’s leading developmentally-based early childhood music & movement program from children ages birth – 7 years, send me an email or message me here. I will be happy to reserve a spot for you in one of our classes. I found this article today as I read through one of my new favorite blogs, http://creativewithkids.com, and it was just too good not to share! The article is not from this particular blog, but from one of the author’s affiliates, http://www.notjustcute.com; these two blogs are working on doing a whole series on, “Parenting with Positive Guidance: Building Discipline from the Inside Out” which has some pretty interesting stuff in it! I definitely recommend checking it out. by Amanda Morgan, Creator of NotJustCute.com. “Henry Wadsworth Longfellow wrote, “Music is the universal language of mankind.” It is a transcendent medium, one that takes on a variety of forms to meet the intrinsic needs of each person. It is enlivening and motivating. This we can all agree on. What has been debated in recent decades is the relationship of music to learning. Brain Child or Whole Child? The True Value of Music for Preschoolers. Go ahead, Let them Play!!! This is a great post that introduces the rapidly-growing trend of using “Tools of the Mind” curricula in early childhood education…..the curricula are designed as play-centered activities to supplement the traditional literacy and numeracy programs. The idea is that guided free play allows children to develop abilities in creative problem-solving, conflict resolution, emotional self-regulation and creativity/self expression in ways that traditional classroom teaching methods cannot. I think this is a fascinating and wonderful step forward in our attitudes toward early childhood education, and in raising happy, healthy children. So go ahead……let them have that extra 5 or 10 minutes to play before bed, it may be one of the best things you do for them! There are sound educational reasons as to why a play-based approach is a good idea in the early years of school. Youngchildren may switch off from learning if all activities are teacher-led and they have to sit and listen for long periods of time. Play also develops children’s thinking skills. Children learn to think through problems, rather than learning facts. Knowing facts is not that useful in new situations. On the other hand, teaching children to be able to think creatively about a problem, without worrying whether they are right or wrong is a valuable skill. Many schools now teach thinking skills in their lessons but young children learn this through play. Fisher (1992) analysed the results of a number of studies into children’s play and concluded that children who are engaged in more pretend play perform better on tests of cognitive, language and creativity development. Posted by Kindermusik with Amanda in Child Development, Learning, Music Makes a Difference! A great little article that gives a very brief overview of some of the non-musical benefits music has on our brains and our ability to learn…..
“(NaturalNews) Northwestern University scientists have pulled together a review of research into what music — specifically, learning to play music — does to humans. The result shows music training does far more than allow us to entertain ourselves and others by playing an instrument or singing. Instead, it actually changes our brains. So what is it that musical training does? According to the Northwestern scientists, the findings strongly indicate it adds new neural connections — and that primes the brain for other forms of human communication. What’s more, children who have had music lessons tend to have a larger vocabulary and better reading ability than youngsters who haven’t had any musical training. And children with learning disabilities, who often have a hard time focusing when there’s a lot of background noise, may be especially helped by music lessons. “Music training seems to strengthen the same neural processes that often are deficient in individuals with developmental dyslexia or who have difficulty hearing speech in noise,” Dr. Kraus stated. The Northwestern researchers concluded their findings make a case for including music in school curriculums. “The effect of music training suggests that, akin to physical exercise and its impact on body fitness, music is a resource that tones the brain for auditory fitness and thus requires society to re-examine the role of music in shaping individual development,” they wrote. 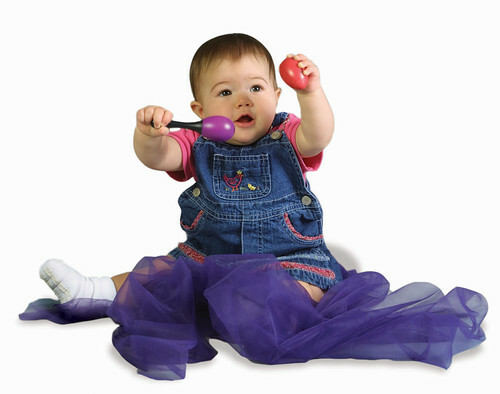 The Original Early Childhood Music & Movement Program! Posted by Kindermusik with Amanda in Child Development, Early Childhood Education, Kindermusik, Learning, Music Makes a Difference!, Parenting Info, Why Kindermusik? For more than 35 years, Kindermusik has been bringing together experts in education, music, and child development to create the world’s leading early childhood music and movement program for children from birth to age seven…to date, more than 1.1 million families, in 60 different countries, have experienced the joys of Kindermusik classrooms. Originally formulated in the late 1960’s for kindergarten children, this music & movement program has a unique approach to learning that is based on the works of some of the most brilliant (and famous) educators and musicians from Europe and Asia, including Shinichi Suzuki, Maria Montessori, Zoltan Kodaly, Carl Orff, and Emile Jaques-Dalcroze. Our curriculum is, “research-based and research-proven”. We take great pride in being able to say that our experts continually monitor emerging research so that we can give you the very best materials, activities, instruments and programs. 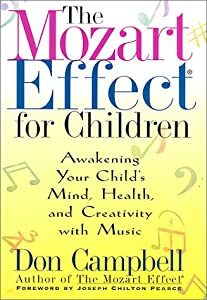 In the past several years, research in the areas of early childhood development and education have become increasingly focused on the amazing effect music has on children’s ability to learn and grow. It has been proven that early experiences with music actually physically create neural pathways in children’s brains, making the connections needed for every type of intelligence. In our classrooms, each activity we do is designed to support the development of the “whole child,” which means we strive to nurture and strengthen skills in all areas of development…musical (of course! ), physical, emotional, social, cognitive and linguistic. But all that scientific stuff aside, Kindermusik classes are so much fun! Imagine being able to take a few minutes out of your busy week to do nothing but sit back and enjoy watching your child learn and grow! Child-centered – Every child is musical and every child is unique. We celebrate this individuality and invite children & families to explore, learn, respond and contribute in the manner in which they choose. Developmentally Appropriate – Early childhood developmental stages follow a predictable sequence of growth. A thorough understanding of the interests, abilities and appropriate learning methodologies for each stage allows us to choose activities and lesson plans that support the development of the whole child (keeping in mind that every child develops at their own pace, which is perfectly normal). Nurture the Whole Child – We create “integrated” learning experiences through music & movement, allowing them to foster growth in all other areas of development: physical, cognitive, social, emotional, and linguistic. Process, not Performance – Children are encouraged to explore, engage in, and enjoy all activities without any preconceived expectations of a particular outcome. The value is in the process itself, not the product. Our goal is to create musical children, not child musicians. Inclusive of the Parents – We recognize that a parent, or loving care-giver, is a child’s first and most important teacher. It is our job, as Educators, to affirm their efforts, educate them about their child’s developmental stages and create a supportive community in the classroom. Fun for the Child, Fun for Families – Children respond best when they are having fun; creating a positive, enjoyable classroom experience encourages them to repeat activities, songs and games over and over. Repetition leads to the mastery of developmental skills and learning new concepts. Incorporating parents and siblings in these learning experiences strengthens family bonds and encourages healthy family dynamics. Highest Quality Materials, In Class and at Home – Kindermusik uses extensive research, piloting, testing and the consulting services of experts in a variety of different fields to create the highest level of quality for all materials. “At Home” materials are a vital part of the Kindermusik experience because they allow parents to bring lessons from class into their homes and continue reinforcing new skills and concepts throughout the week. So what is it that truly sets us apart from our competitors? As I mentioned above, our focus on the educational process, and on supporting growth in all areas of development, adds a whole new dimension to the fun and excitement of music class. We prepare children for a lifelong love of music, and to give them a solid foundation for learning. Plus, we have 35+ years of experience on our side, which we’ve used to fine tune our methods and perfect our craft. Most other early childhood music classes put children of all ages together in one class, but Kindermusik classes (with the exception of our “Family Time” class) are divided into developmentally appropriate age groups. This means that children are in an environment of their peers, who are in the same age range and at the same developmental skill level…just like school! But beyond the incredible educational benefits, the thing that really sets Kindermusik apart from all the rest is the attention and support we give you, the parent. Rather than treat you like a spectator, as most music classes do, we recognize one of the guiding principles of early childhood education: You are your child’s most important teacher, and home is the best place for learning. We are well aware of how daunting this task is (since most Educators, themselves, are mothers or grandmothers), and understand that parents need more support when their children are infants and toddlers then at any other time in their children’s lives. That’s why our curricula are designed to teach you all about the nuances of each stage of development, and give you tons of ideas for songs, storybooks, activities and exercises to do with your child both in the classroom, and even more importantly, at home. There is no substitute for the quality bonding time you and your child will experience! Don’t Take My Word for It…Ask the Experts! Research has shown that music is the only activity that stimulates each of the developmental centers in the brain simultaneously -musical, cognitive, physical (gross, fine & locomotor skills), social, emotional, and linguistic. Kindermusik recognizes the amazing implications this has in early childhood education; the rich, multi-sensory experiences that are at the center of every Kindermusik lesson physically create neural pathways between the right and left sides of the brain, maximizing their learning potential, and setting them up for a lifetime of success! Playing with objects such as the scarf play in Kindermusik Village encourages baby to make sounds and words and helps her anticipate outcomes which are central to conversational development and language acquisition. 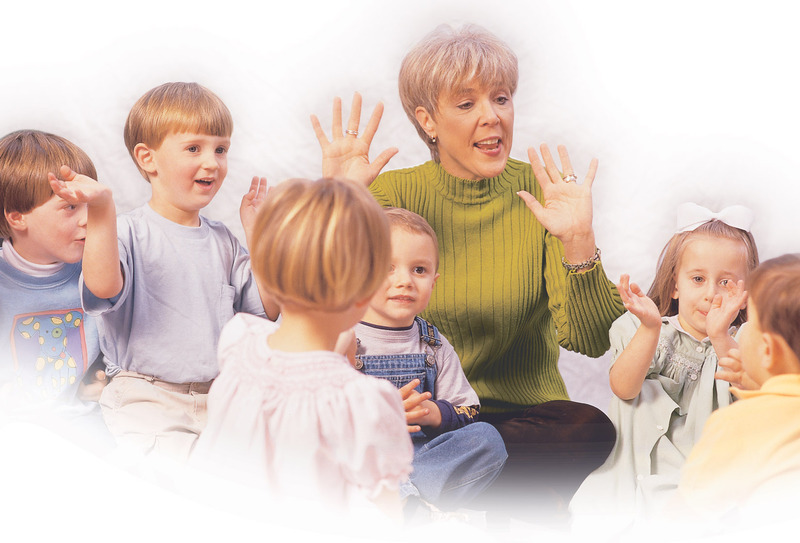 Varying pitches between high and low in Kindermusik class stimulates these first foundations for a baby or young child’s learning the variety of sounds of language. Kindermusik addresses a child’s development in many various and powerful ways. Repeated exposure to musical activities develops important cognitive and behavioral skills. 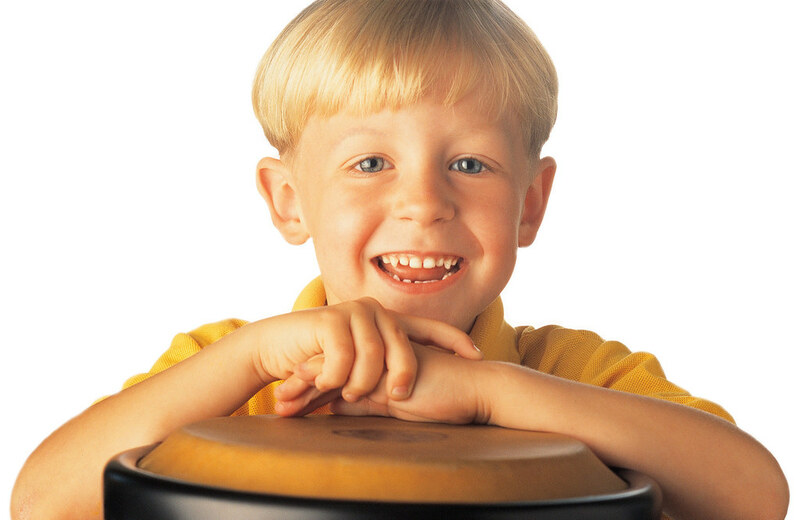 Some musical activities can help develop inhibitory control – the ability to control or stop one’s movements. Also changing volume, rate and pitch in songs and activities teaches a child discrimination, a crucial factor to listening and language processing. Current research has shown that movement is the key to learning at any age. Our brains fully develop through movement activities such as crawling, rolling, turning, walking, skipping, reaching, and much more. When children and adults participate in Kindermusik classes, they are developing both sides of their brains through structured and creative music and movement activities. Television, video games and computers have helped to produce a generation that struggles with learning problems, hyperactivity and obesity. Many of these problems can be helped through systematic music/movement exercises and patterns. Kindermusik classes have always been fun. Now I feel strongly that they are also part of our essential learning process! A major task for toddlers, that can confuse parents at first, is resolving the conflict between their passionate desire for closeness to their parents -after all, they are still barely out of babyhood- and their equally fierce drive for independence. Activities such as those in the Kindermusik “Our Time” curriculum provide toddlers this opportunity. 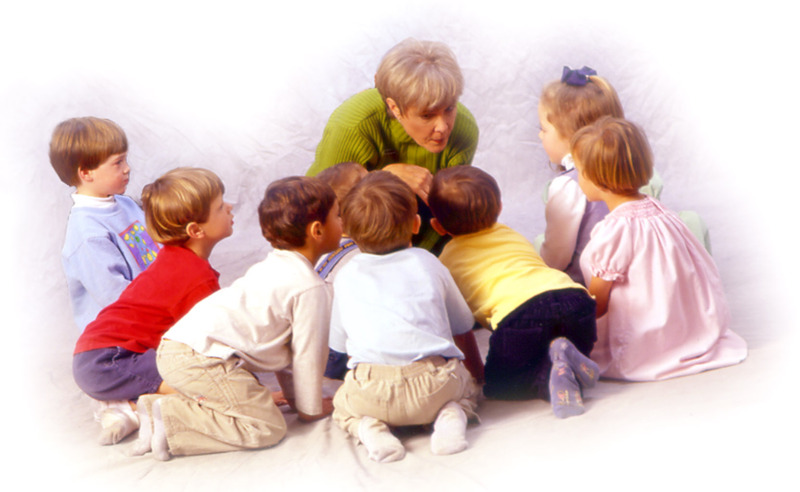 A child can move into the circle during story time and actively participate if he wishes, or he can stay close to Mom or Dad and listen to the story being read. Given this security, most toddlers will naturally move to greater, and more appropriate, independence as they approach preschool age. When introduced appropriately, music and literature play an amazing role in the development of infants and toddlers. I’m happy that Kindermusik has extended its programs to include this time of life when brain development is most vulnerable and parents are most in need of support and direction. One of my strongest impressions of Kindermusik’s work is the variety of musical selections that are there for my children. The selections are of high quality and of considerable diversity, such that children can listen and respond to the music of Bach, Mozart, contemporary composers and cultural traditions around the globe. Kindermusik understands that children deserve opportunities to know a palette of musical colors, and thus through the program provide windows to the world of people and their artistic expressions. This rainbow of musical colors is the stuff that surrounds children through their Kindermusik training,so that their listening, movement, singing and playing possibilities are grounded in history and across cultures. These musical beginnings set children straight for a lifetime of well-considered choices in their musical and cultural valuing. Music as a curriculum in its own right is a valuable one. There are no winners or losers in Kindermusik class -the only competition is with one’s self, which is a crucial part of educating children with special needs. Kindermusik incorporates not only the joy of music but also movement, touch, listening and socialization that are so important for children with varying abilities.